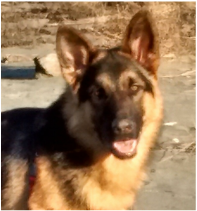 Testimonials - Canines Moving Forward - Dog Behaviour Specialist - Lower Mainland, BC. Please scroll to the bottom to leave a testimonial - Thank you! Micheal is a skilled and knowledgeable individual who was able to help me better understand my one year old Husky Shepherd, Max. I am very pleased and beyond happy with the results of only two sessions. I reached out to Micheal because Max would often be reactive on leash and would always be in a neurotic state of mind. Max was well socialized as a puppy, so I couldn't understand why Max would growl, bark, and sometimes lunge at other dogs when we were on walks. After meeting with Micheal, I finally began to comprehend why Max would behave the way he did. I learned so much about my dog's behaviours and was able to adjust the way I handle Max in various situations. Max is now able to walk by other dogs on leash without making a peep or responding. Of course we still have good days and bad days but I am now definitely more confident and comfortable being outside with Max all thanks to Micheal. We have two rescues who are part husky. Our newest one is a 3 year old male who turned aggressive and out of control. We tried many different trainers, techniques, and collars and felt at a complete loss. We couldn’t let him off leash and he spiraled into a more anxious and crazy dog as time passed. It got really bad. Michael is truly amazing, and I feel so lucky we found him. He taught us how to take control back, how to direct our dog and be the leaders again. Our dog is turning back into the sweet gentle boy he once was and his anxiety has lowered a ton. He no longer panics when we leave the room and we are able to enjoy walks again. There is such a difference between a dog behaviourist and a trainer! Thank you so much Michael. - Tyler and Tori, Delta, BC. I want to thank you again for helping us with Pharaoh! I feel like we have a completely new relationship with him. He is so much happier, we are much more relaxed. We cannot thank you enough! We are constantly getting comments on how well behaved our dog is. We can’t thank you enough for our help with Bodhi, but more importantly your help with US. You taught us how to be pack leaders, and regain the control in our household. Bodhi was a very reactive and high energy golden retriever. Once we had our son, we had some issues of him being possessive of my son, my husband, and myself. He became reactive towards other dogs, would pull when walking on a leash, jump on the counters, and was just a very imbalanced dog. After two sessions, I am beyond amazed with the progress that we have all made. He now respects us as his pack leaders and doesn’t feel the need to control every situation. We have even been able to take him to the off-leash dog dykes where he will walk beside us until we tell him he can go run, and even comes back to us when called and now plays calmly and safely with the other dogs. He rarely jumps on visitors when they come in the house or jumps on the counter. Michael has given us the tools to help Bodhi become a more balanced dog. This truly has been a lifestyle change for us and we couldn’t be more grateful for all of Michael's help and guidance. We will be recommending him to all of our friends and family!!! - Matt & Jessie, Maple Ridge, BC. It’s only been a couple weeks since I saw you, and I’ve been working Bodhi pretty hard every day (with his dominance and fearfulness) - backpack walks through the busy downtown streets and off-leash walks in the dog park. He is definitely gaining confidence at the dog park and I’m even seeing progress on our busy downtown walks too. We still have work to do, but he is definitely moving forward. ​Michael Bylo is not your average dog trainer. I admit I first Googled 'dog whisperer in Vancouver' because my husband and I wanted more than basic obedience training for our mini Australian Shepherd Willy. 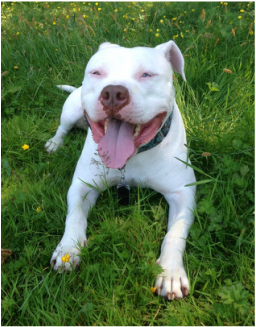 Willy is a smart, lovable and gentle dog at home, but on walks he would often get defensive with other dogs, displaying dominance which made walking him stressful. When Michael first came to our house his calm disposition was off the charts. He oozed a quiet confidence that was so powerful and yet unassuming even Willy did not get up to check out this stranger in our home. It became so clear to us that the anxiety was all ours and we were unknowingly transferring this nervous energy to Willy, making him unsure of who was in charge. Working with Michael was inspirational and enlightening. He focused on our role as pack leaders and gave us the confidence to trust Willy and ourselves. We learned the value of exercise for Willy on a mental level. He also showed us how we unintentionally reinforce undesirable behaviours in Willy and how we can successfully correct them using discipline through body language and touch, not verbal commands. The sessions with Michael were actually therapeutic as he gently exposed our insecurities and then offered us the tools so we could confidently handle encounters with dogs on our walks or at off leash parks. No more panicking or crossing the street to avoid dogs! ​We are so grateful for his help and can't wait to take Willy out every day! We still have more to learn and practice but with Michael's continued guidance and support we are on the path to having a calm, respectful, and lovable dog. - Melanie, Ben and Willy the Mini Aussie, Vancouver, BC. ​Thank you for your help with Charlie Michael Bylo. After learning how to be a better "leader" to my dog, his attitude when walking changed very quickly, and he behaved much more respectfully and attentively to me - which makes my life with my dog that much happier and better. Much appreciated. If anyone has a dog that needs a little tune up with behaviour issues Michael is awesome and great at explaining why we need to behave a certain way to help our dogs be better dogs. Thank you again. - Amber, Cloverdale, Surrey, BC. "​I have to send a HUGE shout out to Mike for his time with me, my son, and our 10 month old Rottweiler/Mastiff cross “Hercules” yesterday. 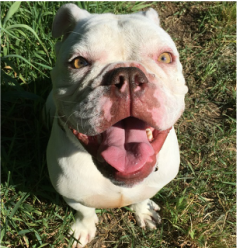 I hired Mike to help with preventing Hercules from lunging and pulling towards other people and dogs on our walks and to show me how to get his excessive excitement under control. At 10 months and already 110 lbs, learning to walk calmly and effectively was a serious must! Mike spent 2 hours with us, giving us free range to ask him any questions and told us we are in no rush. 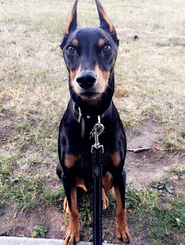 I learned within minutes that the areas I wanted help with were actually symptoms to the true issue at hand, and the issue was with me, his owner. I lacked leadership. The way Hercules acted was due to lack of knowing who is in charge, since I was clearly not. I thought I was doing all the right things though. I learned how it’s about training the owner, not the dog, and I got a lesson on more than just leadership, and now have a deeper understanding of how dogs naturally communicate and how to get them to respond to you using that knowledge. After only a short while, Hercules became so focused on our walk with Mike, making direct eye contact and his excited reactions to other dogs and people were down to a minimum. Mike even spent one on one time with my 12 year old son and taught him how to develop leadership with our big pup. After Mike left, I shared with the family what Mike taught me and everyone kept up with the new ways all evening and Hercules was like a whole new dog. Eye contact, respecting our personal space, listening on the 1st attempt, and it was amazing. Even waking up this morning, he continued his new awesome ways. But to be honest, Hercules now has someone to follow. He knows who the leader is and this is his natural state as a dog so he was never the issue, it was with me and my leadership. Now the real work begins and I am excited to continue the process of developing my leadership skills and being consistent with our amazing new pack member. " Tomas & Herc, South Surrey, BC. ​"She's doing so good. You have been a life saver. Literally. I'm not sure we can thank you enough. The biggest struggle/learning curve is her excitement when we are leaving the house. Letting us go down the stairs first and her loud voice is a work in progress but we give ourselves extra time each time we leave and just keep working on it. She's definitely getting it quicker and quicker each time. Walking on leash has been life changing and is actually enjoyable now. We've been hiking and passing dogs without any reaction at all. Gracie is doing great too!" "Frankie is a great puppy but was having some major issues walking away from home on the leash. It was definitely a mental block, as he would walk perfectly fine walking towards home. I tried 1-2x/day for the last month to break him of this stubborn habit of putting on the brakes and literally not moving, with zero improvement. I mean it, he was like walking / dragging a boulder on a leash. Thanks to Michael Bylo with Canines Moving Forward w/ Michael Bylo. Frankie now is able to walk down stairs and walk on a leash with no hesitation. AMAZING!! It's like I have a new dog! Michael's 2 dog's were so amazing to watch- sharing their wisdom with Frankie and helping him become a more stable puppy. A huge thank-you to Michael Bylo for helping us achieve our puppy goals! Anyone out there who has behavioural issues with their dog: Get Michael to help you! it's amazing what he can do. I'm so excited to share my walks with Frankie now, no more frustration Yay!" - Suzanne, Ryan & Frankie the Frenchie, South Surrey, BC. We just wanted to give you an update on Tikaani!! After your visit with us back around Christmas time, he literally became a different puppy over night with the techniques and training your provided US!! We quickly realized that Our behaviours had to change. Within a matter of a few days, Tikaani's aggressive nipping had completely stopped. He is Such a good boy now. We still use the techniques you showed us currently when a new bad behaviour starts and he responds well to it. We definitely look forward to a follow up visit in a few months. - Kehly, George and Tikaani, South Surrey, BC. I have a male English bulldog named Chester. He started to show aggressive signs about one and a half years ago. One of the major concerns I had with his aggression was his aggression towards children. He would easily turn aggressive and try to charge at children that ran past him. On the day of the training, Michael and I took Chester to a near by elementary school and we waited there until crowds of students came out from their classrooms. We then walked by those children many times and cut through the playground with children running and screaming. Michael demonstrated the ways for me to correct Chester and the magic was instant. 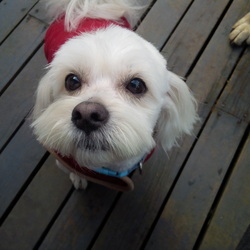 After the training session, I walked Chester alone and passed through the elementary school and playground again, my mind was just completely amazed by the change that Chester had in that one training session. I am very thankful for the work that Michael has done, it has been a dream of mine to see my dog become a better and balanced dog! At about a year old our friendly and sociable puppy started acting out aggressively to both people and other dogs. We had a visit with our vet for check up and she tried to bite her. The vet told us that some dogs are this way and it will take a lot of work, and suggested giving Canines Moving Forward a try. She then gave us Mikes card. After our first visit the changes were incredible. She is soo much calmer and no longer tries to bite everyone in the elevator. Her confidence is growing daily and we are able to take her to the dog park. We recently had to take Sadie into the vet for booster shots and she was shocked at the changes in her. We can't express our gratitude to Mike enough! We highly recommend Micheal and his services. After several attempts with different trainers and programs we were at a loss in correcting some issues we were having with our pup. Michael's approach was direct and extremely informative. Within 48hrs of our first meeting, our pups behaviour and our reaction had completely changed, by the second meeting it was a 99% improvement. We couldn't be happier. The change has alleviated so much stress for us and other family members. It is allowing us to focus on a healthy and very happy relationship with our pup. Thank you Michael. ​- Kim & Paul, Surrey, BC. We were at our wits end with our rescue dog of four years and on the verge of having to make a drastic decision when our friend introduced us to Michael. Louis was very reactive with other dogs and impossible for me to safely walk. We had been through several trainers with no positive result. We were using a muzzle for everyone's protection, yet he was constantly leaping at other dogs. In the very first session, my husband and I saw a difference, a very different, yet fair approach, that helped us feel hope. After only several sessions, I am happy to report that I am able to walk Louis comfortably around other dogs, it is amazing and we are very grateful. - Jill, South Surrey, BC. Our Pitbull mix Kira became an absolute nightmare to walk on-leash, she would pull, lunge/growl/jump basically freak-out whenever she would see another dog. We love her dearly and we were pleased with her inside our home, but walking her was a nightmare. She left me feeling two emotions after a walk; frustration & embarrassment. Since I was unable to walk her, I was also unable to hike mountains with her due to her inattentiveness and dog aggression. I felt horrible leaving her behind while she watched me leave with our other dog to go hiking. We decided to message Michael with Canines Moving Forward. During our initial visit, I could already see that there was a light at the end of the tunnel. Kira could sense his "dog whisperer" energy and already was showing attentiveness that I could not get from her. Michael was very professional and non-judgmental with our situation. He put us on a pack leader regime and left us with some homework to do with Kira. For the first time ever, I was looking forward to walking her. Each time I would walk Kira, it would become more and more enjoyable as I could see the improvements being made. There became a shift in leadership and Kira quickly learned that I was her leader. Best part of all, I have her as my hiking partner. She has become so attentive and obedient! She loves to hike up mountains with her backpack on, carrying her own food/water/bed. I don't have to even say anything to her, just a simple look and she follows what I do, she's just waiting for her next command. 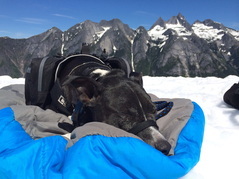 Thanks to Michael's help, I have my beloved dog hiking beside me up and down BC's mountains. Thank you! - Courteney, Peter & Kira, Langley, BC. guess our choice to bring him home. We would take him for 3 hour walks and he would still destroy our home. He was mischievous, destructive and had horrible separation anxiety. We made the stupid mistake of not having a trainer right from the start. When we found out I was pregnant we realized it was time to change things. We got a dog behaviour specialist, Michael Bylo, and we leaned all about Willis and what we were doing wrong. As I sit here and watch him gently play with my 15 month old I'm so very happy we didn't give up on this amazing dog. He has his quirks (we all do) but he's by far the smartest and most loving animal I have ever owned. - Megan and family, North Vancouver, BC. My dog's behaviour had become very unpredictable. He was showing aggression towards people and other dogs. His anxiety was so high that he would go after people while on walks. He had bitten a couple of people and I was told he should be euthanized. I knew I needed a dog trainer right away. I contacted Michael who was recommended to me. He started working with Fez, and the changes in him are remarkable. Walking him is now a pleasure, and people who were once afraid of him have also noticed the change. He goes to doggie daycare twice a week now and loves it. He now goes to the groomers which was not even a possibility the last two years. Thank you Mike for all you did for Fez and for teaching my family how to be good pack leaders. - Judy and Family, South Surrey, BC. "We rescued Patches in November 2012. Shortly after his adoption we realized he had severe separation anxiety. It seemed that whatever training we did, Patches would destroy our new house when we were away at work. We tried mental stimulation and physical exercise to tire him out, every morning at 4:30am before going to work, which was recommended to us by other dog trainers. It worked for the first few days, and then he went back to the same destructive behaviour. We were starting to lose hope that our dog would never be left alone, which effected our social life. We're huge Cesar fans and would try to implement his techniques, but had a hard time following through. So when a co-worker recommended a dog trainer who had trained with Cesar, we knew he was the perfect fit. Mike showed us how to be the pack leaders, and made sure that my boyfriend and I were on the same page, when it came to Patches. With Mike’s techniques, knowledge, our hard work and dedication we're now able to leave Patches at home without worry." - Chantelle, Chris & Patches, Langley, BC. 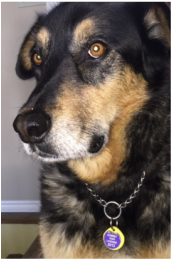 ​Mike and his extensive knowledge of animal behaviour, different techniques, and lots of patience, has restored peace and happiness back to our home! 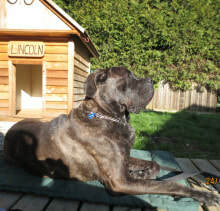 Mike took on our bull-mastiff, Lincoln, with ease and confidence and taught us how to have a healthy pack. 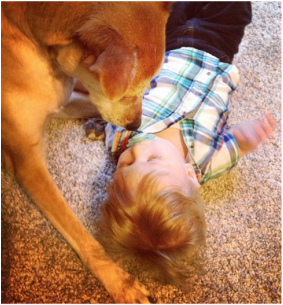 Lincoln had taken on the role of "protector" of our new baby boy. At first it was cute, but it got to the point where others weren't able to hold the baby because Lincoln would bark and make people uncomfortable. He had total reign over our house, including the couches and our bed. I began to feel nervous around other dogs because of Lincoln's hyper activity. We would walk really late at night or not at all, which didn't make us feel good as his owners. That's when I called Mike. The few hours that he was here teaching us some techniques were so beneficial. The consistent application of the techniques has changed our lives. I feel so much more confident in Lincoln when we go out for walks, and when we have people over. He is part of our family again. If you have ANY issues or concerns with your dog I strongly urge you to contact Mike. He is so knowledgeable and just amazing at what he does, and incredibly thorough. I had so many questions, and threw different scenarios his way, and he was able to answer them all and make sure it all made sense to us. Even though Lincoln is still a work in progress, he's already made huge strides to becoming the awesome dog we knew he could be. We can't thank you enough for all your help with Lincoln! Thank you SO much Mike!" - Jess M. & family, Delta, BC. Jessie is a young, high-energy, Golden Retriever who interacts well with her family. Unfortunately, Jessie has some behavioural issues outside of the home. Rolling leaves and birds had me experiencing full-body workouts on her walks, and on occasion, a full-body take-down. 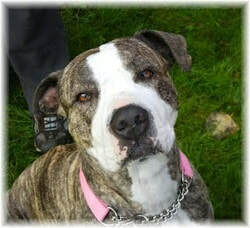 However, the worst came from her unpredictable, aggressive behaviour toward other dogs. 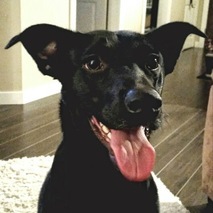 In an instant, Jessie could go from a happy-go-lucky dog to an aggressive fighting disposition. The local dog parks were no longer an option as we never knew what to expect and did not want her to injure another dog. Off-leash runs were no longer an option, as you never knew what to expect around the corner in the trails. I had enlisted the help of another dog trainer and was feeling frustrated. With all the time and effort (not to mention cost) I was finding little improvement or optimism that her behaviour would ever change. Then I heard about Mike. Even after the first session with Mike our challenging walks have turned into enjoyable excursions, and running on leash is sooo much better. She has not taken me down in months! 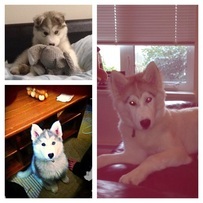 We are still working on her aggressive behaviour and we are already seeing improvements. I think the fact that we can now read her and other dog’s body language better is giving us more confidence with the social interactions. I know that with Mike’s guidance and reassurance we will get there. The hardest part is keeping the family “with the program”. If only the family was as easy to train as the dog!" - Sue & Family, Surrey, BC. 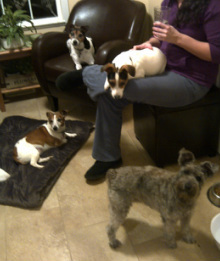 Dawson, my 11 month old Jack Russell, Zoey, my 16 month old Schnauzer, and I, decided to move into a different home where two other Jack Russell’s resided: Jessie, 14 years old, and James, 12 years old. The four dogs had play dates together prior to the move, and in small doses it seemed manageable. Once we relocated, I continued to walk my dogs, and left the other two at home. J & J would howl and yelp the entire time we were gone. D & Z were not trained to walk without pulling, and didn’t listen, so there was no way I was going to attempt walking all four at once. When they were at home, they had the run of the house –including sleeping with me, jumping up on any piece of furniture they wanted to, and James continually marked every piece of furniture he passed. They fought amongst themselves for my attention, a couple of times drawing blood. Our house was out of control!! I talked with my co-worker about how I was at the point of having to move again - just to separate the dogs. 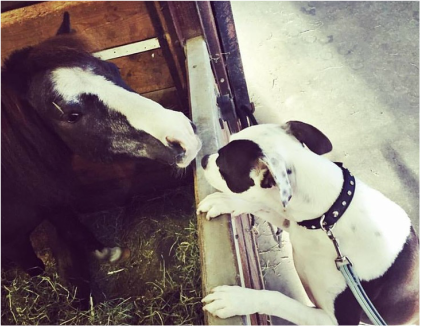 She suggested I call a dog trainer who had helped her – I did, and he worked a miracle! - Brenda, Dawson, Zoey, Jesse, and James, Langley, BC. ​Prior to hiring Michael Bylo to help us with our dog Willis, walking him was a nightmare. He misbehaved and wouldn't listen, creating huge anxiety in both myself and my wife. As he is a rescue, we realised there would be issues, but this began to wear on us. Having bonded with Willis already, getting help was our only option...We loved him too much to let him go, but a solution was badly needed. Upon our first meeting with Mike, we learned amazing things about Willis's behaviour, and how our actions, although done with the best of intentions, often reinforced this behaviour. Walking Willis with Mike left us amazed and educated. Even after Mike leaves our training sessions, the things we've learned continue to progress - and Willis is becoming a joy! Mike is a very personable guy with a wealth of knowledge that has allowed us to enjoy our time with Willis again. Thanks Mike, looking forward to the next session!" - Jack, Megan and Willis Bernard, North Vancouver, BC. ​A few of us at Doolittle's Animal Rescue have had the wonderful opportunity of knowing and observing Mike when we were volunteering at the local shelter, and he was working there. We later needed his assistance with one of our rescue dogs. There is no doubt in any of our minds that Mike has a gift with helping and understanding dogs, and we are very thankful that he did not hesitate to help us with our Mary. Many of us had worked with Mary on a daily basis for over a year, where she showed such progress with her aggression towards other dogs on her walks. Unfortunately, our founder who she stayed with became ill which Mary could sense and began to take over again as the leader. We didn't want all that progress to go backwards, so we contacted the one person we knew could help her continue to move forward. Mike came to help us out with her, without any complaint. He never judged Mary, he wanted all of us and her to 'move forward', and so we all did. His total calmness reflects off of him and onto the dog.. it is amazing. Mary was a tough case because she did not have an owner who could work with her on a daily basis, so becoming her foster parents was another caring act by Mike and his partner, Sara. 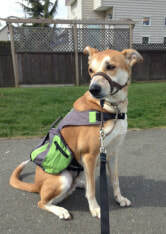 While she was in his care, he was able to work more closely with her and use his pack to help teach her what it is to be a dog vs. guard dog. Some dogs with behavioural issues are sometimes too quickly judged... Mike is not that kind of person who judges, he makes a difference, both for the dog and their owner(s). Through his passion and dedication, he was able to help Mary find her forever home at last. He was also able to show her new owner how to be the right kind of leader for Mary. We all are so glad to know you and respect your gift for life!" - all of us at Doolittle's Animal Rescue, Surrey, BC. Your testimonial will be posted within 24-48 hours - Thank you!